To advertise the occupations of those working below, a bicycle wheel that rotated in the wind was fixed to the roof of the workshop in Green Lane, just off South Parade. 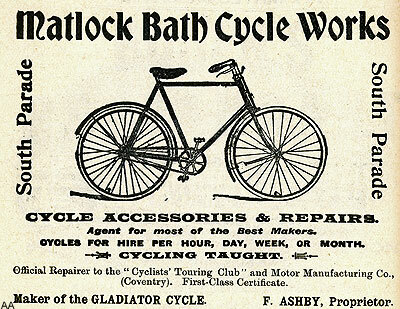 The Ashbys, father and son, made bicycles; their name is on the signboard straddling the lane and the 1903 advertisement, below, says they made the Gladiator Cycle. The father and son team were also Cycle and Motor Repairers and provided accommodation for cyclists in the left hand portion of the building, with the garage in the middle under the arch. They had "Dunlop Tyres In Stock", according to the sign in the foreground. Frederick Ashby senior was a former farmer from Lincolnshire. He seems to have left his wife about 1897, presumably when he settled in Matlock Bath with his son Frederick William. Part of their business was to let out cycles for hire. Unfortunately, an incident in 1902 caused a problem. A young man from Ashton-under-Lyne, accompanied by another from Clay Cross, enquired about the cost of hiring two cycles with the original intention of cycling to Ambergate until it was suggested a trip to the Via Gellia would be better. A deposit was collected and the two young men set off, but the cycles were not returned when they should have been so Mr. Ashby contacted the police. The young men seem to have used the bikes to head for home and one was eventually found in the warehouse of the hirer's father in Ashton, marked with a label stating "Forward to Mr. F. Ashby, Cycle Works, Matlock Bath". Mr. Ashby eventually decided to take action against the two miscreants. The Ashton lad was discharged but the Clay Cross teenager had sold the bike to a pawnbroker and it had then been sold again. He was sentenced and Ashby was awarded some compensation for loss [of earnings]. In 1904 he had a lucky escape whilst he was driving a car through Matlock Bath when a dog ran under the wheel and the car was badly damaged, partly by fire. He had six passengers who were badly shaken. However, he had the presence of mind to cut off the petrol tank and prevented an explosion. A couple of years later his application for a motor charabanc to ply for hire at the Bath was refused by Matlock Bath UDC. 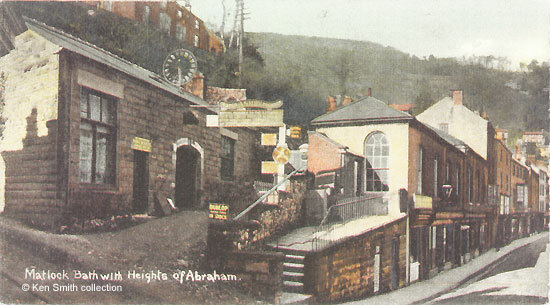 Harry Ashby, Frederick's brother, also moved to Matlock Bath and became the lessee of Hodgkinson's Hotel. The brothers had a motor partnership but in early August 1907 there was a hearing at Wirksworth County Court when Harry Ashby sued his brother Frederick for dissolution of the partnership and for value arising out of the firm's assets. He caused a sensation a few weeks later when he attacked his brother's housekeeper, May Wright, having broken the door down at midnight with a chisel whilst his brother was seeking help. Apparently he intended to turn Miss Wright out, and she slapped him in return. When the case came to court he said "that woman is robbing our eyes out" (she seems to have been the book-keeper for the cycle business). Whilst her husband served his sentence Mrs Ashby was given the license temporarily and was applying for a fortnight's extension a few months later. There was even a petition about the case that was sent to the Home Secretary, signed by people from Matlock and Morton (where Harry had lived), asking for a reduction in the sentence he had been given but the Home Secretary replied that he couldn't interfere with the sentence passed by the bench. May Wright tried to claim for loss of earnings but it was agreed that she had not been dismissed by Fred and had received wages. premises. It is the only other postcard to do so. 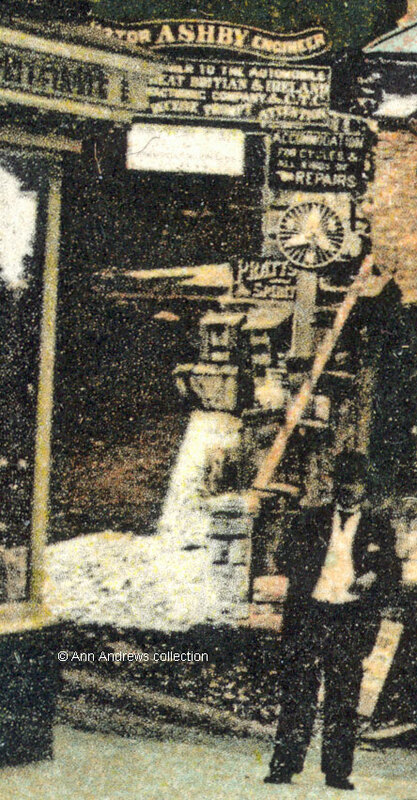 Unfortunately, Frederick's Matlock Bath business did not survive and at the end of 1907 there was a Deed of Assignment for the benefit of his Creditors. May Wright seems to have lent Frederick money as in 1908, when she was living in Scarthin, she sued as a creditor - once again for wages but also for money lent. The lives of Harry and his wife seem to have returned to normality and they moved away. The shop was a marble turners and a blacksmiths at one stage, before become Lizzie Higton's fish and chip shop. Although it had been rebuilt by Harry Gill in the interim, if you were around in the 1950s you probably remember "The Singing Kettle" café at this location. There was a Cyclist's Touring Club blue sign on the wall and a fish and chip shop at the far end. FOR CYCLES AND ALL KINDS OF REPAIRS. They also sold PRATT'S SPIRIT, which was a motor oil. 1. "Matlock Bath with Heights of Abraham". Postcard In the collection of, provided by and © Ken Smith. 2. Advertisement from "Abel Heywood's Guide Books, With Cycling, Walking and Driving Routes. Matlock Illustrated." (1903) Abel Heywood & Son, Manchester & London. Advertisement in the collection of, provided by and © Ann Andrews. 3. and 4. 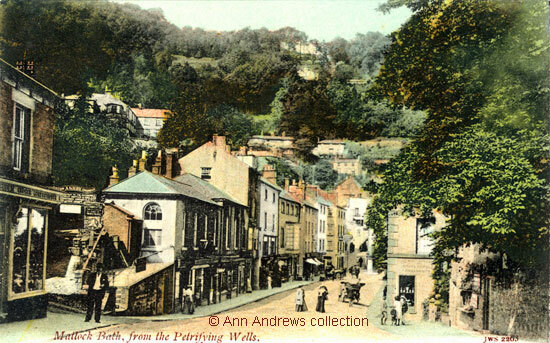 "Matlock Bath, from the Petrifying Wells". Published by JWS [J. Welch & Sons, Portsmouth], No.2263. Not used, but another card was posted in 1904. © Ann Andrews collection. Images scanned for this website, information researched by and written by and © Ann Andrews. "London Gazette", 13 March 1908 - creditors were required to sent in their debts or claims. This was not uncommon with small businesses at that time and many recovered from this, sometimes with the wife taking over the business. 1891 census of England & Wales, when he was living at Side Drove, Heckington, Sleaford with his wife Mary A Ashby and three children. That census says he was born at Crowland in 1855, whilst his son Frederick was born at Skegby. He had married Mary Ann Tomlinson at St Andrew, Skegby on 1 Aug 1881 and their son Frederick William was baptised in the same church on 22 Apr 1883. "Derbyshire Courier", 31 August 1907. "Derbyshire Times", 13 September 1902. "Derby Daily Telegraph", 6 January 1903 and "Manchester Courier and Lancashire General Advertiser", 6 January 1903 - Matlock Cycle Agent's Action. "Derby Daily Telegraph", 19 August 1904. "Derbyshire Times", 18 August 1906. "Sheffield Daily Telegraph", 9 August 1907. A Matlock Motor-Car Partnership. Also from "Derbyshire Advertiser and Journal", 30 August 1907. "Derby Daily Telegraph", 27 June 1907. "Belper News", 13 September 1907. "Derby Daily Telegraph", 29 August 1907. Mrs. Ashby was applying for a fortnight's extension and the Notts Home Brewery made the application. Information from the 1911 census (available on Find My Past). Harry died in 1925 and his wife in 1946. It is unclear what happened to Fred. Reminiscences of the late Mr. Frank Clay, from his private papers and notes owned by the web mistress.